At the culmination of the celebrations, Lady Maslenitsa will wave winter goodbye. Spring fever is in the air, as the fun-filled Maslenitsa party hits the capital – and there’s a lot more on offer than just pancakes. Do you like to make pancakes? Personally, I don’t. My first pancake is always a flop and so, as a rule, is my last – possibly because I don’t know how to jiggle the frying pan properly. To treat yourself to really good pancakes is another matter entirely. Russians make pancakes fairly often, though not necessarily on the Russian folk festival immediately preceding Lent known as Maslenitsa. But don’t believe the popular myth that the Russian tradition is to eat pancakes or blini with spoonfuls of caviar. The Soviet Union would probably be alive and kicking today if comrades had enjoyed such luxury – they did not. Anyway, should you happen by London's Trafalgar Square on Sunday, March 6, the delicious sweet-smelling pancakes will not be served with black caviar. But don’t worry: they there will be in abundance, together with pirozhki (small pies). There will also be many bizarrely dressed Russians resembling living Matryoshka dolls, and a strolling bear who will give you his paw – if you have the courage to take it. Meanwhile tuneful balalaikas, folk orchestras and the best voices on the Russian stage promise to give such a powerful performance that the Trafalgar Square pigeons risk going deaf. What did you expect? Gulyat means to entertain (sometimes to excess) – and the Russians are famous for it. To outdrink a Russian, outscream a Russian, outdance a Russian is a difficult business, indeed. You may suspect Russians of any sin but dreariness: with them there’s never a dull moment. And during holidays, such as Maslenitsa, this irrepressible energy is used purely for fun and amusement. On the same day, Maslenitsa will be celebrated all over Russia, and at 3pm GMT, Londoners will be able to wave to fellow party-goers near Red Square via satellite link. So don’t hesitate to come. 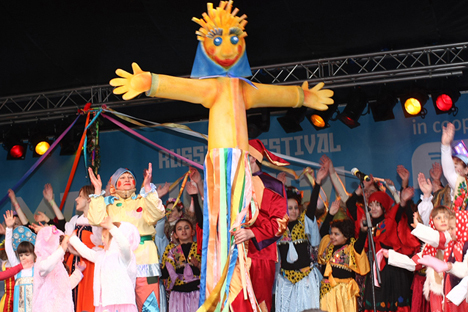 This will be the first-ever celebration of Maslenitsa on Trafalgar Square. Pancakes have never been made at this famous London landmark – and certainly never by Russian bakers. The idea of firing up skillets under the protection of Horatio Nelson is the brainchild of Olga Balakleets, a charming Russian businesswoman who has been importing Russian culture to Britain for close to 15 years. In the early nineties, Balakleets graduated from London’s Royal College of Music and married “local lad” Julian Gallant a musician and now the director of the Russian cultural center Pushkin House. She then made a typically feminine decision: She brought what she loved best from her native Russia to her new home in the UK. She started her own company for this purpose, Ensemble Productions, and became an avid promoter and organizer of Russian events, from tours by leading ballet companies to rock concerts. A self-styled Russian cultural attaché, Olga is organizing Maslenitsa in London for the third time. Here is the simplest and most popular version of oladi, a traditional form of Russian pancake. 1. Separate egg yolks and whites. Mix yolks with sugar. 2. In a small pan, melt butter. 3. In a bowl, combine flour, sour cream, salt, butter and egg yolks, stirring vigorously to form a batter. 4. Add baking soda to milk, then pour into bowl. 5. Whip egg whites, add to bowl, and mix again. 6. Once the batter is ready, place a few dollops (not more than 3-4 inches in diameter) on a preheated pan and fry briefly on a low/medium heat until underside is golden brown. Flip and repeat, being careful not to burn. Oladi should not more than 3/4 of an inch thick. 7. Serve with sour cream, jam or honey. And enjoy! How did she manage to find the funds to underwrite this festival given that nobody has any money to spare nowadays? Well, everyone chipped in a little: the London Mayor’s office, the Russian Ministry of Culture, the Moscow City Government and the Onexim Group, one of the largest private investment funds in Russia. However, according to a Russian saying, “You don’t bring your own samovar with you while visiting a friend.” Then why are Russians coming to visit Londoners with their own samovar, and even their own pancakes? In order to feel at home in their friend’s house, of course. Nobody knows exactly how many Russians live in Britain today. But this much is clear: there are an awful lot of them. Professor Donald Rayfield, a Chekhov translator, once joked to me that it had become impossible to have a private conversation in Russian on the London Tube: invariably there will be a native Russian speaker in the same carriage. Britain has become a home from home for (if not the permanent residence of) hundreds of thousands of Russians. In gratitude for this hospitality, they have taken to sharing with the British what they have: rich culture and traditions. People who lived for many decades behind the Iron Curtain are now discovering a world that had been closed to them. That is why it is so important to Russians to show themselves and to see others. And to make a foreign country feel like home – with one’s own samovar, one’s own pancakes, and even one’s own bear.